The first four months of this year have been busy with preparing the network meetings in Tel Aviv (March) and Prague (May), designing and implementing a new BELMA website and trying to recruit new members. At the beginning of the year, Søren Peter Sørensen joined the management board, replacing Teuvo Sankila who had been serving the board for many years, three of them as the chairman of the board. Søren Peter, coming from a digital publishing house, has a particular interest in (and a keen eye for) websites. Therefore, under his guidance, the management board decided to have the BELMA website modernized and made more customer friendly. The specifications for the new design were done with internal resources and at low costs. You can see the results here. However, since the costs had not been budgeted for at the Frankfurt AGM, the budget was slightly revised, and the new version can be found online in the members' section. Possible re-location of BELMA to a different venue from Frankfurt: After long discussions this decision was postponed. Frankfurt still seems to be the meeting place for publishers and related businesses, even if they do not have a stand themselves. The costs at BETT that we researched are far too high in comparison, and not enough people attend the London book fair (as was also shown by the What Works conference). All other fairs are either too global (worlddidac) or too regional (Didacta ). We are therefore monitoring the options and will discuss this again at the AGM. New BELMA price structure: To attract more non-members to the award, the price for non-mebers was lowered to 500 Euros for the first entry and 400 Euros for the second. The price for members was slightly raised to 300 Euros for the first entry. This policy seems to work well, since 30 per cent of this year's entries came from non-members. Of course, we are also looking at the BELMA to attract more members for the EEPG. Network meetings - costs: since the last networks have been very well attended (at no cost to members), and the EEPG is spending more money for renownded Keynote speakers, it was decided that a small fee will incur if members send more than two participants to the network meeting. These costs can vary (up to 80 per person depending where the network takes place), but are mainly used to cover for catering costs. So, if you have any personal contacts at those publishing houses and/or have contacts in others, it would be good if you could actively lobby for EEPG and also send us your contact details. The first meeting in 2017 was held in London during the London Book fair (15th March). A new chairman (Wilmar Diepgrond, Germany) and a new vice chairman (Jaume Vicens Barceló, Spain) were appointed for a two-year period. Jay Diskey, out going chairman, strongly endorsed the role of IPA-EPF as the voice of educational publishers, supported by members from over the 30 countries, the only organisation with global scale and still growing. He saw the challenge as being seen of doing more on digital. European members of EPF have been working for closer collaboration between EPF and the Federation of European Publishers, to enhance the lobbying capability in Brussels. A small group has prepared a paper for discussion by the FEP board at their May meeting. The paper will be circulated to EPF members after the meeting. A WIPO SCCR meeting took place in the first week of May in Geneva. Developing world groups want a broadening of exceptions for education. So far the EU, US and 'Group B' (developed countries) are holding firm, and IPA brought educational publishers to a side event at the SCCR meeting to demonstrate the threat to their own publishing sectors deriving from the positions adopted by SCCR delegates. You can find more information here. There will be an IPA position paper on educational exceptions, which we will publish once it is available. Michele Woods, Director, WIPO Copyright Law Division was invited as a guest speaker. She has worked at the US Copyright Office. Topics for SCCR are currently a possible broadcasting treaty, and exceptions and limitations in the following areas: libraries & archives; educational institutions; and disabilities other than the visually impaired. Education is the most important for developing states, but EU etc. are not interested in a treaty, with licensing schemes already in place. An extensive study of educational exceptions at national level is still evolving. There is no consensus in SCCR, and no working document exists. A scoping study on what member states are doing about "other disabilities" is getting under way. The new Deputy DG wants to do pilot studies before moving forward and is willing to involve IPA over the provision of textbooks for developing countries. The short-term objective is to demonstrate how existing solutions are working by supporting local industries without the need to change laws, although it is acknowledged that many countries give over the primary level market to state provision. Special Session on Accessibility after Marrakesh. There was a presentation about the UNICEF "Universal Design Accessible Textbook" project that is developing an innovative solution to bringing digital books to learners of all disabilities. Estimates indicate up to 150m children with disabilities, 80% in the developing world. At the heart of this effort is a format extension to EPUB3 that allows "multi-rendition" of ebooks. In practice this means short texts or other textbook elements can be accompanied by special audio and video clips that address specific disabilities. This demonstration of a simple example from the prototype shows the incorporation of sign language into a textbook. The technology has to be practical and this is where early publisher input and engagement is needed. Speakers Gopal Mitra, a program specialist from UNICEF, and Pedro Milliet, a program director from Brazil urged educational publishers to get involved in the development and to pursue the new market opportunities that the project reveals. There is a New FEP brochure: The Book Sector in Europe: Facts and Figures, which is available as a download from the FEP website. Next EPF: It was agreed to convene the next EPF in Geneva on 26th/ 27th June [changed from 22nd/23rd June as proposed in Vienna]. Frankfurt: The EPF Open Forum will be on Friday 13th October. Proposals for presentations will be discussed at the next meeting. IPA World Congress (held every two years) will be in New Delhi beginning 14th February 2018. An educational publishing panel will be included. This year, the EEPG helped organize the What Works conference, suggesting speakers and participants in the panel discussions. Therefore, Sintija Buhanovska from Zvaigzne, Brian Gilsenan from CJFallon and Teuvo Sankila from Otava and Helga Holtkamp from EEPG (as replacement for a German teacher who could not participate due to a strike) were all taking part in the panel discussions. However, despite a reasonable attendance (120 in the room), the event was thought to lack sparkle. A dominant UK-orientation and an intensive opening session on copyright law left many behind. The event also lacked a unifying theme and there was hardly any audience participation. The content was OK, but nothing "really new" and presented in a format that was difficult to follow. The decision to discourage visual presentations (PowerPoint etc.) meant that the audience had to concentrate very hard. Also, the purpose/target group of the conference is not quite clear, whether it is publishers or policy makers. So, if you didn't go, you definitely did not miss a lot. There should be some presentations online soon. However, there will not be a What Works conference in 2018 - but definitely an EEPG conference in Ljubljana! Both keynote speakers gave interesting insights into the changing world of education, Henry Warren as a former Pearson employee, now working with emerging markets in Africa, and Kirsten Campbell-Howes as the director of education at Busuu, a very successful start-up in language learning. Kirsten talked mainly about the inner workings of a start-up and the challenges of managing teams of people, while Henry explored the different ways big and small companies have dealt with disruption. Clustered around the keynotes were interesting presentations by the hosts and the participants. Due to various holidays - and despite me chasing up participants, only a few presentations are online so far. Please check this link in the near future. 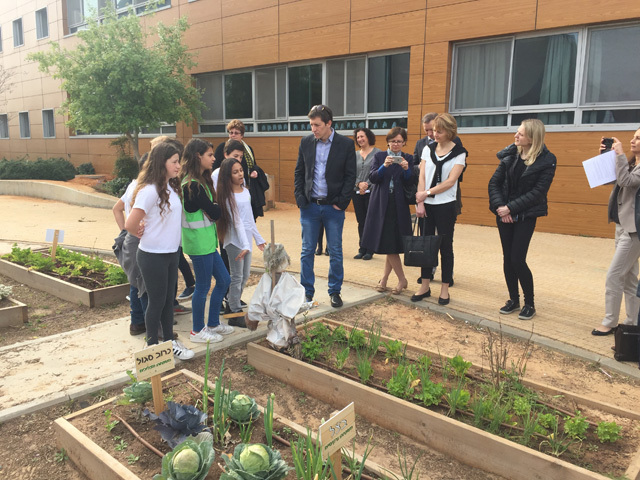 One of the (many) highlights of the network meeting was a trip to the Green School in Kfar Saba, where we had the opportunity to observe different classes and were led around the facilities (which are impressive) by a group of young students with very good English. But of course, there was also ample opportunity to discuss and exchange ideas. Here is a photo of one of the dinners on the wonderful beach front of Tel Aviv. For those participants who stayed for the Shaping the Future conference, there was a n opportunity to use the "bridge day" for an organized trip (by CET) to Jerusalem and the Dead Sea. Artur Dyro took some great pictures, so please contact him if you were on the trip and want to see the photos. The conference, which was a huge event and attracted educators, politicians and and innovative leaders from technology and finance from all over the world, took place at the Hilton in Tel Aviv and also at the headquarters of CET. The conference was organized by CET and opened by Gila Ben Har, CEO of The Centrer for Educational technology and Gila Gamliel, Minister for Social Equality, Digital Israel project. There were renowned speakers such as Martin Dougiamas, the founder and CEO of Moodle, or Rose Luckin, Professor at UCL Knowledge lab but also many start-ups that had the opportunity to present their ideas and products. The first day of the edtech summit provided not only food for thought about the future of education but also valuable insights into the development of technologies enhancing the learning and teaching process. The 2nd day was devoted to smaller interest forums and provided opportunities for in-depth discussions and sharing knowledge with experts from all over the world on diverse topics related to digital developments. There is more information about Shaping the Future (and the Hackathon related to it) here. From this website, you can also go to Youtube where many of the speeches and presentations can be watched (some are in Hebrew and while they were translated at the conference, this is not the case here). 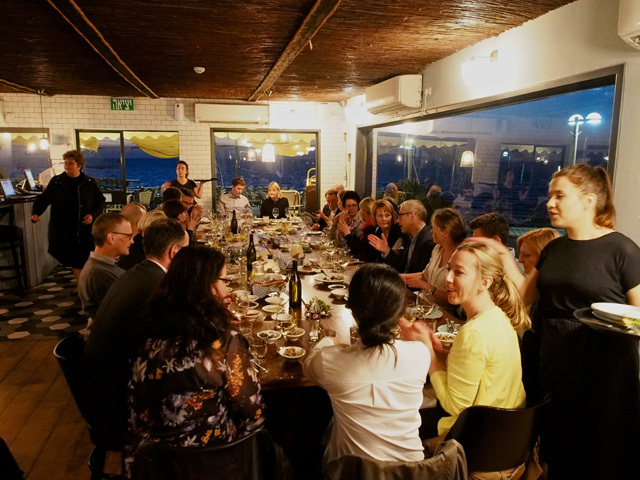 For a very personal view from one of the participants, Nina Iles of the British Educational Suppliers Association, please click here. Following two successful network meetings in Belgrade and Athens, it was decided that it would be useful to give publishers some easy to understand arguments that they can use in discussions about OER or exceptions for education etc. Here is a text by Professor Dusan Popovic that you can put on your website if you wish. Please feel free to translate it into your language and use it with politicians or educators. The next network meeting is in Prague on May 10th, 11th and 12th. You'll find all the information here in the members section. There will be 24 participants from 12 countries, not counting our hosts, Fraus Publishing. Last minute registration is still possible via the website. The third network meeting in 2017 will be in Dublin on September 14th and 15th. The topic will be social media in learning, teaching and marketing. A detailed agenda will be available in June and registration will be possible once it has been published. Official BELMA registration closes May 5th. Please have a look at the new website. If you have not registered and have second thoughts, but know that you will not meet the deadline, please contact Jean-Claude Lasnier. He will be able to help you even if you are a few days late. This year we have very few entries in category 1 and 4, so we particularly would like to see pre-school material and vocational or further education material. Remember that for EEPG members there is a special BELMA discount, the cost is 300 Euros for the first entry and 240 Euros for all following. Here is an article that should already be well-known to our Danish member, Systime, because Poul Henrik Mikkelsen is commenting and presenting his views on the hot topic: The Digitization Dilemma. And here is an interview with Benjamin Wüstenhagen, the founder of the start-up K.Lab, who talked at the Publishers Forum in Berlin at the end of April. I'd like to remind you of last year's publications by Eurydice. Here is a list of 2016 publications with an updated publication on the structure of European education systems. The Eurydice network provides high quality information on a wide range of aspects of education policy and practice in Europe. With the support of national units based in 38 countries, Eurydice provides descriptions of national education systems, comparative studies devoted to specific topics indicators and statistics. Eurydice reports cover information from EU Member States as well as other countries participating in the network and are available in various languages. Please also read this very interesting article about Homework. I have been asked to forward this link. MathodiX is an adaptive Mathematics platform, which uses Machine Learning algorithms to analyse each step of the student solution in order to map their skills, knowledge and needs. They would like to partner with European publishers that sell content for middle and high school Mathematics. As always, with no judgement concerning quality or else, I leave it to the EEPG members to get in touch directly.